When I was in grade-school, an uncle taught me something about limits, and about doubling. He asked me: How many times can you fold a piece of paper in half? Before I could reply, he told me that the answer was eight. I thought this seemed too low. So, as a child eager to demonstrate adults’ errors, I located a sheet of writing paper and began folding. I managed seven folds—not even achieving the predicted eight. I thought that the problem was the small size of the paper. So, I located a newspaper, removed one sheet, and began folding. I folded it eight times but could not make it to nine. Why this limit? Most people assume that the problem is the size of the sheet of paper: as we fold it, the paper gets smaller and, thus, the next fold becomes harder. This is true, but the real problem is that the number of sheets to be folded increases exponentially. Fold the paper once and it is two sheets thick. A second fold brings the thickness to four sheets. A third fold: eight. A fourth, fifth, and sixth fold: sixteen sheets, thirty-two, then sixty-four. The seventh fold doubles the thickness again to 128 sheets, and an eighth to 256. When I was a child folding that sheet of newspaper, in attempting that ninth fold I was straining to bend 256 sheets. Now, if I started with a very large piece of paper perhaps I could prove my late uncle wrong and achieve that ninth fold. It’s hard to predict precisely where limits lie. Imagine a football-field-sized piece of paper and ten linebackers assigned the task of folding. Those players could certainly make nine folds. Perhaps they might even achieve ten, bending 512 sheets to increase the thickness to 1,024. Maybe they could strain to make eleven folds, bending those 1,024 sheets to achieve a thickness of 2,048. But eventually the doubling and redoubling would reach a point where it was impossible to double again. Exponential growth creates a doubling problem. Our petro-industrial-consumer mega-civilization has a doubling problem. During the 20th century we doubled the size of the global economy four times. 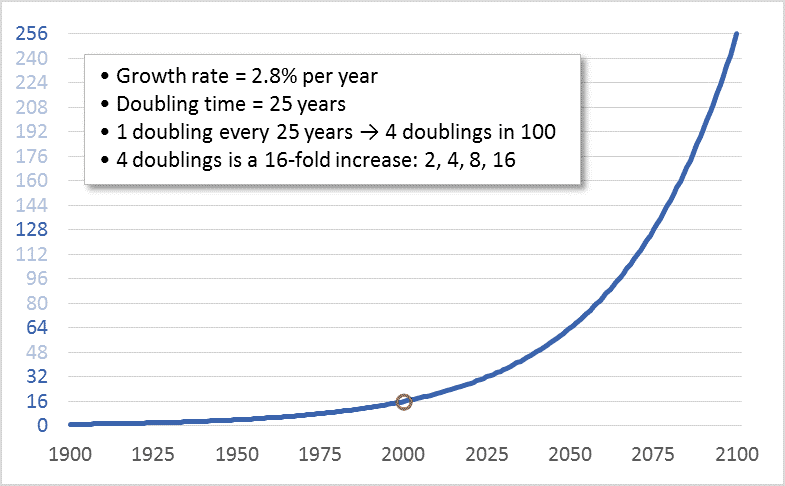 Four doublings is a sixteenfold increase: 2, 4, 8, 16. Despite this multiplication, today, every banker, CEO, investor, Minister of Finance, shareholder, bondholder, and would-be retiree (i.e., nearly all of us) wants to keep economic growth going. And we want growth to continue at “normal” rates—rates that lead to a doubling in the size of the economy about every 25 years. Thus, in effect, what we want in the 21st century is another four doublings—another sixteenfold increase. The graph above shows the sixteenfold increase that occurred during the 20th century and shows what a sixteenfold increase during the 21st century would look like. 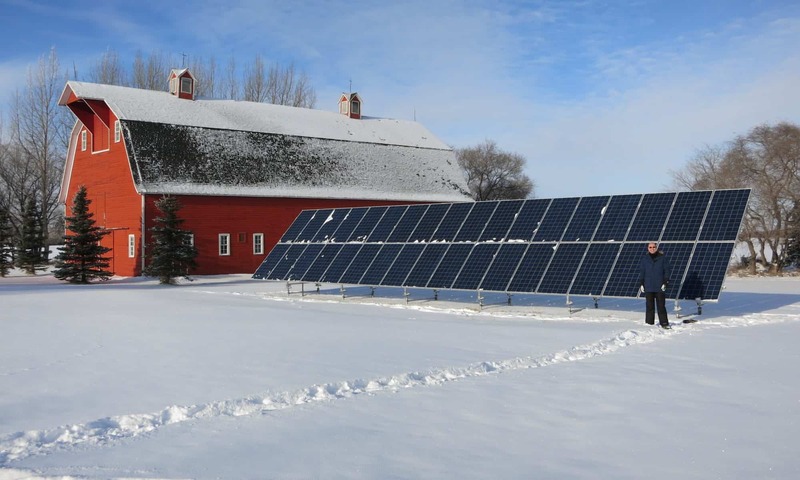 The first doubling of the 21st century is already underway. We’re rapidly moving toward a global economy in 2025 that is twice the size of the one that existed in 2000. But the economy in 2000 was already placing a heavy boot upon the biosphere. By that year, North America’s East Coast cod fishery had already collapsed, greenhouse gas emissions were already driving up temperatures, and the Amazon was shrinking. Despite this, we seem to believe that a 2025 economy twice as large as that year-2000 economy is “sustainable.” Even worse, in 2025, we won’t be “sustaining” that two-times-2000 economy, we’ll be working to double it again. Clearly, at some point, this has to stop. Even those who think that the Earth can support and withstand a human economy twice the size that existed in 2000 must begin to have doubts about an economy four or eight times as large. There can be no dispute that economic growth must end. Though we may disagree as to when. Perceptive readers will have noted a shortcoming in my paper-folding analogy: That system runs into hard limits; at some point, attempts to double the number of sheets simply fail, and that failure is immediately apparent. Our civilizational-biospheric system is different. Limits to Earth’s capacities to provision the human economy and absorb its wastes certainly exist, but they are not hard limits. Given the immense power of our economy and technologies, we can breach Earth’s limits, at least for a time. On many fronts we already have. It will only be in hindsight—as ecosystems collapse and species disappear and the biosphere and climate become destabilized, damaged, and hostile—that we will know for sure that we’ve crossed a terrible line. Only then will we know for sure that at some point in our past our doubling proceeded too far. So, unlike paper folding, determining the limits of economic growth requires human wisdom and self-restraint. Thanks, Paul. I appreciate the encouraging words. Humans are not good at grasping the ramifications of exponential growth.